Happy Halloween! Weather's been a bit nuts here in New England, rain, heavy winds. We were without power for quite a while on Monday, and I had to toss most of my treat plans out the window. 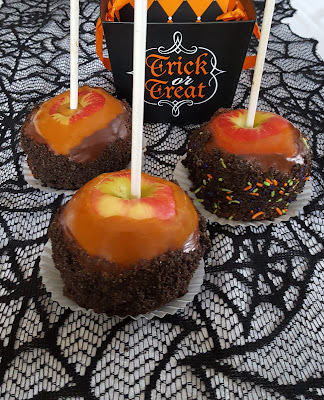 Luckily, these Ultimate Oreo Caramel Apples come together in no time at all, and in a pinch, you can melt the caramels and chocolate on a gas grill :) I bought the caramel bits this year, so much easier than having to unwrap and melt the bigger chunks. I had semi-sweet chocolate on hand, so that's what I used. I also threw in some Halloween sprinkles to add a little more color. Caramel and chocolate are two of my favorite flavors, and these didn't disappoint! Thank you so much to Jennifer G for sharing her recipe! Do you have an amazing recipe you'd like to submit to Taste of Home? Follow this link and learn how! Want to apply to be a Volunteer Field Editor? Check out the requirements and apply here! 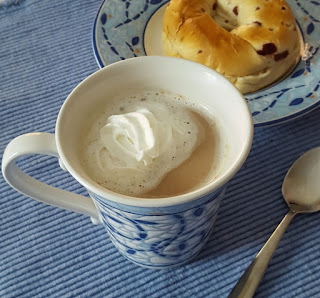 Maple Cream Coffee - Taste of Home Tuesday! Two more Volunteer Field Editors are sharing reviews this week, be sure to click on the links below to check them out! Amy's Cooking Adventures has Pumpkin Spice Waffles. They sound like just the thing for my patio breakfasts. Never made from-scratch gravy before? Tammy Cook Blogs Books made the Simple Turkey Gravy, and it looks fantastic! 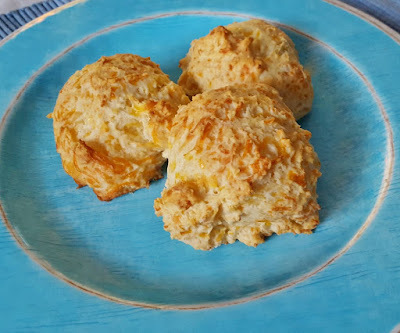 Easy Cheesy Biscuits- Taste of Home Tuesday! Where does the time go? I can't believe it's mid-October! I finally feel like I'm getting a handle on my fall schedule. The name of the game the last few months has been "easy." Freezer meals, quick-to-whip up side dishes. These biscuits are one of our new family favorites. I omitted the crushed red pepper flakes, and used whole milk, it's what I have on hand. I used a large cookie scoop, and I got 12 nice sized biscuits. They are fantastic with soup, stew, or even split with some sliced turkey and a smidge of cranberry sauce inside. So excited to be starting up Taste of Home Tuesday again! This week, two fellow Volunteer Editors are serving up recipe reviews. I can't wait to try both! Do you have an amazing recipe you'd like to submit to Taste of Home? Follow this link and learn how! Want to apply to be a Volunteer Field Editor? Check out the requirements and apply here!